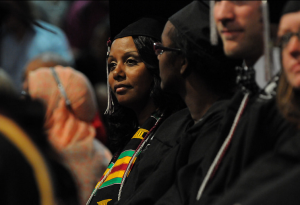 Members of the Augsburg College community were featured in more than 220 international, national, and statewide media stories in 2014. Faculty, students, alumni, friends, and staff shared expertise on scholarship and pedagogy, experience as Auggies, and insight on current and special events. Here we take a look at a very small fraction of the many times Auggies made the news during the year. Thanks to all those who shared their time and stories and helped put Augsburg at the table on so many topics. John Zobitz spoke with the International Business Times. John Zobitz talks to International Business Times: Associate Professor of Mathematics and environmental science researcher John Zobitz helped to answer the question posed by many in the wake of a recent record-setting snowfall in the Buffalo, N.Y. area — Why is it so cold and snowy in November? The reason is global warming, according to Zobitz and other scientists studying the Earth’s climate. Read more about how changes in the Earth’s temperature influence weather patterns on the International Business Times website. Auggies in the Augsburger Allegmeine: Three Auggies were featured in a story in the Augsburger Allegmeine’s series, “We are all Augsburger.” Natalya Brown ’14, Kayla Feuchtmann ’14, and Jens Pinther ’14 shared photos of themselves on campus, their areas of study, and comments about Augsburg College’s namesake with the German newspaper’s Nicole Prestle. See the story on the Augsburger Allegmeine website. Click on the photo in the story to go to a gallery of photos of the three students. Katie Clark, nursing faculty, talked with Girls Life for the August/September issue of the magazine which is read by 2 million girls. 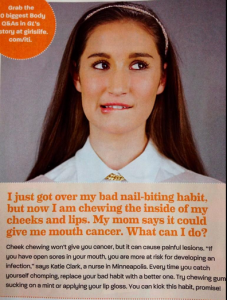 Katie Clark in Girls’ Life magazine: Nursing instructor and the director of the Health Commons, Katie Clark, spoke in July with Girls’ Life magazine to answer questions posed by the magazine’s readers. The publication, which has a readership of more than 2 million girls ages 10-15, is sold at many major bookstores throughout the nation. Clark answered a range of questions for the August/September issue of the magazine. Alex Peterson ’16 talks with The Scientist: Augsburg College StepUP student Alex Peterson ’16 was interviewed for the cover story in the February edition of The Scientist magazine for an article titled “Pain and Progress: Is it possible to make a nonaddictive opioid painkiller.” Peterson, a student in Augsburg’s successful StepUP program for students in addiction recovery, shared his story and perspective on opioids. Read the article here. Janice Gladden ’14, left, graduated with honors in communications. Phil Adamo on set with Diana Pierce at KARE 11. Phil Adamo on KARE 11: Associate professor of history and director of Medieval Studies at Augsburg College, Phil Adamo, was a guest on KARE 11 on Halloween to talk about the origins of the holiday. Adamo shared with Diana Pierce and viewers how Halloween started as a Celtic festival that celebrated the final harvest and eventually was incorporated into Christian traditions to lure non-Christians into the Church. He also discussed the origins of the bonfire, jack-o-lanterns, and Halloween candy. 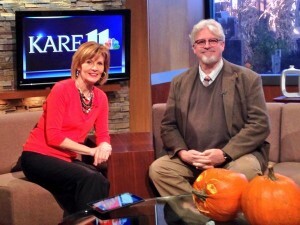 Watch the segment “Halloween History 101” on KARE. Joseph Erickson in the Pioneer Press: Professor of education and former member of the Minneapolis school board Joseph Erickson spoke with the paper for perspective on contract talks between the St. Paul Public Schools and the St. Paul Federation of Teachers. Erickson told reporter Mila Koumpilova that the agreement, which averted a strike, represents a “creative mix of contract changes, addendums to the contract and board resolutions.” Read the full story on the Pioneer Press website. Joyce P. Miller in OR Today: Joyce Miller, an assistant professor of nursing, was profiled in OR Today about her nearly 40-year career as a nurse, transition to the classroom, and work in diverse communities through the Health Commons projects. 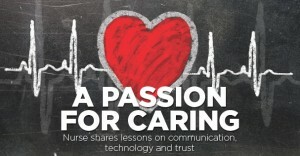 Miller, DNP, RN, shares in the story her perspective on transcultural nursing, actively listening to the needs of patients, the complexity of healthcare, and the importance of establishing rapport and trust with patients. Read “Spotlight On: Joyce P. Miller, DNP, RN” in the online edition of OR Today. For more faculty featured in the news, search the Faculty category on the News and Media blog. Edor Nelson ’38 was presented a special jersey in honor of his 100th birthday. Kuoth Wiel ’13 played a role in The Good Lie featuring Reese Witherspoon. Amineh Safi ’14 in Star Tribune: Star Tribune columnist Gail Rosenblum featured Augsburg College student Amineh Safi ’14 in a recent story examining news coverage of Muslims. In the column, Safi described findings from her research on the portrayal of Muslims in the media and her experiences with diversity in college. Safi’s research opportunity was offered through the McNair Scholars program at Augsburg and conducted under the mentorship of Diane Pike, sociology professor, who also was quoted in the column. Read “Time to look at news coverage of Muslims” on the Star Tribune website.